NASA astronaut Chris Cassidy, a Navy SEAL and STS-127 mission specialist, is set to be the 500th person in space aboard Endeavour after a vote by his crewmates. This story wasupdated on July 10. Among the sevenastronauts launching on space shuttle Endeavour on Saturday, four are makingtheir first flight, an achievement in any astronaut's career. One of thosefour, however, will also be setting a benchmark as the 500th person in history tofly into space. Endeavour'spilot Doug Hurley, mission specialists Chris Cassidy and Tom Marshburn,together with arriving space station flight engineer Tim Kopra, all had a chance at the title,even though they may not have known about it until recently. "We are sokind of bogged down in the training and the mission, and I know that soundsclich?, but I didn't even know that was the case until the pressconference," said Cassidy, just a few hours after the May 28 media eventwhere collectSPACE.com alerted the crew to the record they'd be setting. Determining whichof the four would be the 500th, or even that he was aboard the STS-127mission at all, involved defining the boundary between Earth and space, and whoamong Endeavour's crew would cross that boundary first. "There'sprobably a protocol for stuff like [this]," explained Endeavour's commanderMark Polansky, "and if that's it, well, there you go." Liftoff forEndeavour is set for 7:39 p.m. EDT (2339 GMT) tomorrow from NASA's KennedySpace Center in Florida. The mission has been delayed since mid-June due to ahydrogen gas leak that has since been resolved. Even before YuriGagarin became the first person to enter space in 1961, the governing body forworld flight records, the F?d?ration A?ronautique Internationale (FAI), definedthe demarcation altitude at 62 miles (100 km). Other lines separating the skyfrom space have existed, ranging from 50 to over 70 miles high, but the FAIdefinition, based on where aeronautics becomes astronautics, has been used asthe ruler by which all past flights have been measured. In the 48 yearsthat have followed up until STS-127, 498 men and women (447 men and 51 women)have crossed the 62 mile mark, earning their space explorer wings. All buteight launched on American or Russian government owned spacecraft, although intotal they have come from 36 nations. Four first flew on short sub-orbitalhops, which is why the 500th person in space is not also the 500th in orbit. Like on allspace shuttle missions with seven astronauts, Endeavour'screw is divided for launch with four on the upper flight deck and threeseated on the middeck. Of the four STS-127 rookies, Hurley and Cassidy arestrapped in above, with Marshburn and Kopra below. Their positionat launch however, is less important for the record as where they will be whenthey cross the 62 mile mark. Marshburn had given some thought to that questionas part of a light hearted rivalry with Cassidy. 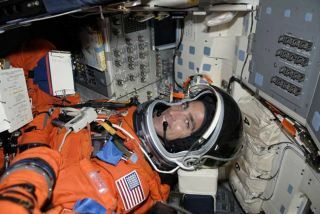 Chosen by NASA to beastronauts together in 2004, Marshburn joked with Cassidy as to who was goingto beat who into space. "I think myseat might be a few feet ahead of his but then you roll upside down, whichmight put me even more in the lead, but it is kind of hard to say," sharedMarshburn. A similarrationale was put forth by members of the 2008 STS-122 crew when determiningthat astronaut Stan Love would be the 300th American tofly in space. Like Kopra and Marshburn, Love rode to space onboard the middeck. Given the flightprofile of the shuttle, which rolls twice on its way to orbit, others on theSTS-127 crew believed the 500th would be Cassidy, who is seated behind Hurleyon the flight deck. Rather than leave the title open to debate, the sevenastronauts met and voted on who would be Mr. 500. "We decidedbetween the crew that it would be Chris," Hurley told collectSPACE.com. "Officially, it is Chris, which I think is awesome." "I'mhonored to have a position, whether it is 499, 500 or 501," explainedCassidy. "If it just so happens to be 500, that's great and it is excitingregardless." Cassidy, who isthe second Navy SEAL-turned-astronaut, will perform three of the STS-127mission's five planned spacewalks to complete the installation of the JapaneseKibo laboratory, move spare equipment, replace some of the International SpaceStation's solar power-fed batteries and finish configuring equipment deliveredby prior crews. Using Cassidy'sposition aboard Endeavour as the model for determining some of the earlierrecords, cosmonaut Gennady Strekalov became the 100th into space onboard SoyuzT-3 in 1980; NASA Administrator nominee Charlie Bolden was no. 200, narrowlybeating now-Senator (then Representative) Bill Nelson, Franklin Chang-Diaz andBob Cenker; no. 300 was either Jim Newman or Dan Bursch, both seated on STS-51on the aft flight deck like Cassidy (with fellow first time flier Carl Walz onthe middeck); and the 400th was Paul Richards, who in 2001 was seated onSTS-102 behind another first timer, James "Vegas" Kelly. For STS-127pilot Hurley, the importance of these records wasn't so much in the title as itwas in what it represents. "I think weare still just in the beginning stages," he said. "We have done somuch over the last several years putting the space station together andobviously we're still working on it, so in that regard, we're just learning howto live in space." "Right nowwe are just in the early stages of space flight and the future holds a lot,especially with the follow-on vehicles and the plans to go to Moon andMars," Hurley continued. "We want to get to a point where everybodyis going." Click here to visit collectSPACE.com and see alist of the first 500 people in space. SPACE.comis providing continuous coverage of Endeavour?s STS-127 mission with StaffWriter Clara Moskowitz and Senior Editor Tariq Malik in New York.Live launchcoverage begins at 12:30 a.m. EDT (0430 GMT) Wed. Click here for missionupdates and SPACE.com's live NASA TV video feed.